Brian is a retired Secondary Teacher. He works for Justice and Peace locally through Justice and Peace at St Peter's at St Peter Apostle Catholic Church, Leamington Spa, attending their monthly meeting (previously its convenor until 2014) with a view to keeping the parish informed on current issues and up-to-date on actions that can be taken, so that parishioners can make informed decisions as to how they can participate. In the Parish he has been involved over the years with St Peter’s Aid for the Needy (SPAN) and was their Chairperson for a time; he was also instrumental in re-establishing a regular monthly Traidcraft stall, which has now resulted in St Peter’s becoming an active FairTrade Parish. More recently he actively pursued the idea of St Peter's being a LiveSimply Parish, which has now materialised. Locally he has been active in ‘One World Link’, a community-friendship link with Bo Town in Sierra Leone and visited Bo in 2006. He has been a life-long member of The Christian Life Community. Bishop Kenney was ordained bishop on 24 August 1987 and appointed Auxiliary Bishop of the diocese of Stockholm and Vicar General. One of his major concerns has been to build up the Caritas organisation of the diocese. In 1988 Bishop of Kenney was awarded an honorary doctorate of Philosophy at the University of Gothenburg for his work in internationalising studies at the university and for his work among immigrant students. Bishop Kenney returned to the Birmingham Diocese in December 2006 as Area Bishop for Oxfordshire, Warwickshire and Coventry. Fr Gerry became Parish priest at our Lady of the Wayside in 1991 after the death of Fr Paddy O’Mahony. Fr Paddy was a well known figure in Justice and Peace circles in the diocese, nationally and beyond. He had been very active in his studies, writing and practical activity in the areas of human rights, ethical investment and development issues since the early 1960s. With his parishioners, Fr Gerry has sought to maintain and develop the long standing Justice and Peace tradition of the parish in its life and liturgy. The parish has an active Amnesty Group – the first church based group in the country and the Fr O’Mahony Memorial Trust was formed in 1995 to support development projects in many parts of the world. Before Shirley, Fr Gerry was chaplain at Coventry Polytechnic (now University) 1983-91. He has always been interested in history, politics and international affairs. He specialised in Spirituality as part of his priestly training in Rome. He was asked to take over responsibility for the Justice and Peace Commission in succession to Fr David Oakley who did much to develop Justice and Peace work in the diocese and especially to implement an ethical investment policy on the foundations laid by Fr O’Mahony. Fr Gerry attends regular meetings of the Diocesan Finance Committee to monitor and develop this policy. Fr. Gerry is now Parish Priest at Sacred Heart, Rugby. Ann was born in Manchester and came to Birmingham in 1972 to study at Newman College. She became a member of Pax Christi in 1977 and was on their Northern Ireland Working Group. She was part of the North Birmingham Pax Christi group, based in Erdington, during the 1990's. Ann has also been active in the past in West Midlands Christian CND, Iraqi People First (campaigning against sanctions in Iraq prior to the 2003 invasion) and Birmingham Catholic Association for Racial Justice, based at the West Indian Chaplaincy in Birmingham where she is a member. She has also been involved in her local community through the Credit Union and currently as part of the Newtown Neighbourhood Forum. Ann worked with older people in sheltered housing for 20 years before taking up her current post as Administrator for the National Justice & Peace Network. She served on the J&P Commission from 1993 to 2003 and re-joined in 2010, representing Pax Christi. Phil joined the Commission early in 2014. He is a retired Secondary School Teacher. As a young teacher he worked in three schools in Zambia from January 1967 to September 1976, which experience has always motivated him to support development projects. Phil was a delegate to the National Pastoral Congress in 1980 and is a member of Pax Christi. He is a member of Holy Trinity Parish in Newcastle under Lyme, Staffordshire and has been the CAFOD parish contact. He maintains contact with an Aids Hospice in Lusaka, Zambia, which has been supported by the parish since the early 1990's. He is also the convenor of the parish LiveSimply group and also currently a schools volunteer for CAFOD and the CAFOD representative for the North Staffs Deanery. Phil is a founder member of the North Staffs Justice and Peace Group. I first became interested in the environment in the late 1960’s when I did my extended essay (nowadays a business plan!) for my Business Diploma on better ways of waste disposal. My findings were to generate electricity by burning the waste (I estimated that the amount of waste produced by London at that time would generate enough electricity to power a small city and, of course, in those days air pollution wasn’t a great issue!). In 1990’s I did a CCRS course with Northampton Diocese and a two-year Pastoral Ministry course at Osterley. In 2010 I obtained a Post-grad Diploma in Christian Theology from Heythrop. I worked for the Northampton Diocese for nearly twenty years and about eight years ago retired and moved to Lichfield where I now live. I was an active member of the CAFOD group in my then parish and was also a member of the local Christian Aid group. I have two children and three grandchildren. My name is Janet Vaughan and for many years I have been an active parishioner at St. Elizabeth’s Church in Coventry. We started a Justice and Peace group in our parish a number of years ago and have been involved in a variety of activities including fund raising for a water well for the people of Lokiliri Village South Sudan, supporting the Purple Community Fund by having Philippian evenings and collecting ring pulls from drink cans. In 2016 I attended World Youth Day with one of our altar Servers. This year I visited India to see the work of the Batthula Trust. While there I visited the Leper Colony, the trust has built 14 homes and helps support the families. In the summer of 2017 I took over from David Jenkins as the Administrator of the Birmingham Justice and Peace Commission. In this role, I am always looking for information about J&P related activities that we can promote on the website and in our newsletters. Anna is a member of the Congregation of Sisters of Charity of St Paul the Apostle, Selly Park, Birmingham. She has worked as a teacher, psychotherapist, and spiritual director and is currently chaplain at the University of Birmingham. As vicar for religious for the Archdiocese of Birmingham, Anna was invited to represent religious onto the J+P Commission. She is one of the founder members of the Selly Park Justice and Peace group set up in 1993. She is responsible for the combined University SVP and J+P student group. Anna’s Congregation has St Paul as its patron and the Congregation motto comes from 1Corinthians 9:22 where St Paul preaches about being “all things to all people”. I see J+P as a way of putting this into action by working for the common good, respecting the dignity of the human person and caring for creation. The moral test of a society is how it treats its most vulnerable. The one who calls him/her self a Christian is bound to act justly, love tenderly and walk humbly with God. Julia and Lizzie are the CAFOD Birmingham Community Participation team and represent CAFOD on the Commission. They work from the CAFOD volunteer centre in Walsall. 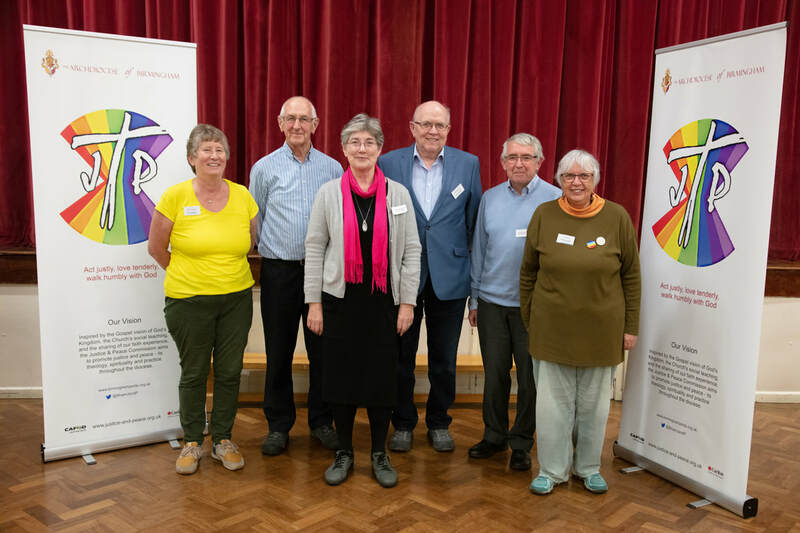 The major part of their role is supporting and managing CAFOD volunteers, who represent CAFOD around the Archdiocese in many ways, such as being the CAFOD representative in their parish or giving talks in parishes and schools about global justice and CAFOD's work. Lizzie undertook a CAFOD Birmingham Step into the Gap Year in 2014 and started this post in September 2015. In January 2015, Lizzie travelled to Zimbabwe visiting communities supported by CAFOD’s partner projects on water, sanitation and hygiene and HIV and AIDS. Julia has worked for CAFOD in the Archdiocese since 1997. In 2012 she travelled to Ethiopia to see CAFOD projects supporting communities in the south of the country to cope with recurring drought. Pat was appointed to the Commission late 2006 as Deacon’s rep, to act as a link between the Commission and the 100 deacons in the Archdiocese (plus those in training). He taught for 31 years in a Catholic Comprehensive School, the last 28 working with children with special education needs. He was Diocesan Deacon Delegate to the National Conference of Diaconate Directors & Deacon Delegates in the late 90’s. Pat is Area Pastoral deacon (Coventry & Warwickshire) responsible for the welfare and care of the local deacons, their wives and widows; and part-time assistant in the Coventry & Warwickshire University Hosptial RC Chaplaincy Team. Pat was his parish CAFOD contact for many years. He has been a professed Franciscan, member of the Secular Franciscan Order for some 46 years, holding office at both at national council and regional level. During the 80’s he was involved with Franciscans for J&P. One initiative Pat helped to organised with Franciscan Missionaries of Mary sisters, was an Interfaith Peace Prayer Meeting in Coventry, on the World Day of Prayer for Peace in Assisi, 27 October 1986, to which Pope John Paul II invited the World Leaders of All Faiths. Some 16 Christian and other Faith Leaders lead the Prayer, each lighting a candle for peace using the text of the Pope’s service in Assisi. Over 500 people of all faiths attended. Was the Administrator to the Commission from 1st June 2008 until 2017, succeeding Anne-Marie Tibbits. David has helped to organise the Witney Parish CAFOD Group for over 25 years, serving as Treasurer for part of the time. He was also active with Aid to the Church in Need in the Birmingham and Portsmouth Dioceses as well as service in other charities locally.